After a fight card ends the speculation begins on who should be placed against who next. 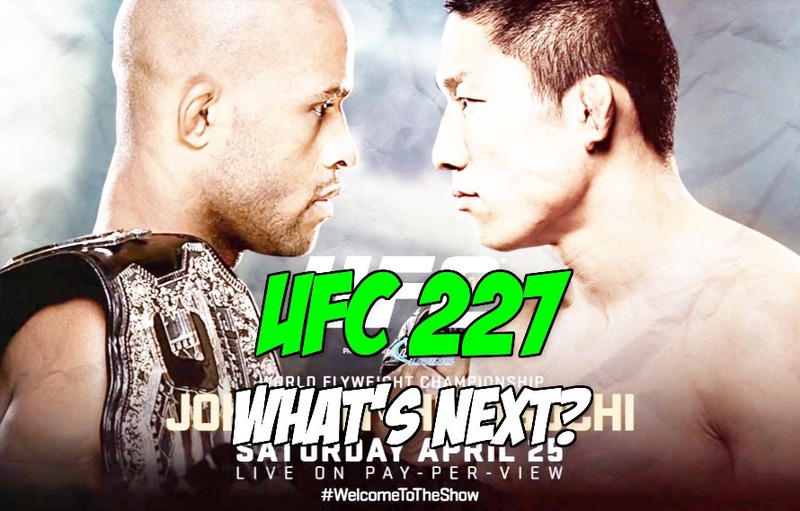 This weekend’s UFC 227 event showed that any one fighter can throw a wrench into the future plans of matchmakers. As we saw for the first time the flyweight king Demetrious Johnson get dethroned by the Olympic wrestling gold medalist contender Henry Cejudo, snapping Johnson’s record eleven title defense streak. There had been talks of Johnson defending his flyweight title against reigning bantamweight champion TJ Dillashaw leading up to this event. The UFC decided to go with a rematch between Team Alpha Male rival, Cody Garbrandt, and champion Dillashaw after the “superfight” talks fell through. The first fight between Dillashaw and Garbrandt was fast paced and full of action. The second fight was just the same, it just ended quicker with the same results. Now the UFC has to go a completely different route, there isn’t much of a craving for the newly crowned flyweight champion Cejudo to go up a weight class to challenge Dillashaw for his bantamweight title. The champion vs champion fight only made sense when Johnson dominantly held the flyweight title. So what happens now? I recently ran a twitter poll with three fight options to choose from to get an idea what other MMA fans were feeling. These are those three fights and where they rank. This is a real super fight in my eyes, a rematch between current outstanding RIZIN bantamweight Kyoji Horiguchi and Demetrious Johnson. The first time the two went around we saw Johnson’s technical handling of the fight. Horiguchi just wasn’t on his level at the time. But as time has passed Horiguchi has grown as a fighter, becoming a real threat in the ring, winning a bantamweight grand prix on New Years Eve in 2017. Horiguchi then went on to flat line Ian McCall in 9 seconds at RIZIN 10 and unanimously defeat Hiromasa Ogikubo in their second meeting at RIZIN 11. There are talks of a kickboxing match between him and Tenshin Nasukawa but nothing is set just yet. If all was right with the world the two would headline at Saitama Super Arena on New Years Eve in the future. The promotional aspect of this fight would be unbelievable too, the UFC has struggled to market Johnson and that’s a shame. But I feel like the VTR’s RIZIN could make for this fight would be outstanding. The veil has been lifted on Johnson, the blueprint is there to beat him. Surely he’ll get a shot to get his title back, and his time with the UFC is far from over, but we can always dream right? There are options at bantamweight but it seems as though there is a rut that the UFC has been stuck in. A three way dance between Dominick Cruz, Cody Garbrandt and TJ Dillashaw. Not to go into full detail but Dominick Cruz had the title first back in 2010 and later vacated due to injuries. Dillashaw became champion after defeating Renan Barao in 2014 and successfully defended until Cruz returned and defeated him in 2016. Cruz dropped the title later that year to Garbrandt who in turn lost the title to his former teammate Dillashaw the next year. And then Dillashaw successfully defended against Garbrandt this weekend at UFC 227. A game of tag you’re it with fists. There are fans saying Dillashaw is now the best at bantamweight. Others consider Cruz being the best as well, which could easily mean this merry go round isn’t over yet. Although Marlon Moraes would be an interesting name to throw into the mix. The former WSOF (now PFL) bantamweight champion successfully defended his championship 5 times before making the move over to the UFC, where he’s had stiff competition since. Losing his UFC debut fight to Raphael Assuncao, who also has a place in all of this, didn’t derail Moraes’s train. It just set him back one fight from getting his chance at earning gold again. Since that last loss, his first since 2011, he’s went on to win a split decision against John Dodson and two spectacular knock out victories against Aljamain Sterling and top 5 ranked contender Jimmie Rivera. He would be a new look for Dillashaw to figure out. And he isn’t a stranger to having gold plated leather wrapped around his waist. There was a time in MMA where Dominick Cruz’s defense and footwork was seen as an unbeatable force. Then Cody Garbrandt came along and robot danced all over him in the octagon earning a decision victory to claim the bantamweight title. Now Garbrandt has lost his title and unsuccessfully attempted to regain it, there seems to be only one way to go from here to get him out of this purgatory he’d fall into. Sure he could fight anyone else in the division but none of those fights have much of a meaning behind them. What if Dominick just had a bad night the night he lost? Would Garbrandt do the worm in their rematch? So many questions that need answers. The back and forth between these two leading up to the fight gave their meeting in the octagon a lot of meaning and there is always room for more banter. Does Garbrandt still have the unbridled confidence he once had as a hungry contender and champion? I think having only one fight between these two would be a mistake. Dominick could use a comeback fight after being injured this past year and Garbrandt defeating Cruz may be his best shot at earning another chance to get his confidence and the title back. These were all just ‘what if’ fights. Chances of them happening are highly unlikely. The most likely outcome we’ll see is Henry Cejudo having his first title defense against Demetrious Johnson. A second bout between Dominick Cruz and TJ Dillashaw for the bantamweight title and claim to supremacy isn’t too far fetched. And Cody Garbrandt is just sort of stuck there with no real way to go so as long as Dillashaw is the champion. Regardless of how the guys in charge set things up I’m sure it’ll turn out alright.